High-tiered smartphones like the Apple iPhone 6s are typically crafted to perform at its best thus promising every user with the best possible smartphone experience. Even so, not all users of these devices have the same positive impression. Some are plagued with software issues while others are troubled with hardware flaws. The iPhone 6s has been tagged among the most popular iPhone flagship devices released by Apple to-date. Nevertheless, this iPhone also has its own share of flaws. Among the most prevalent issues that have been raised by many users of the iPhone 6s is on sound quality, particularly on the microphone output. For some reasons the microphone seems to deliver poor quality audio especially during phone conversations. Static or noisy background, audio cut offs, distant sound or no sound at all are among the widespread concerns. Any of these symptoms has been bothering a number of iPhone users while using audio apps including FaceTime and Siri. Even some of those who are using a headset or Bluetooth device during phone calls are troubled by the same audio problems. Many people considered these among other software-related problems while others believed they are triggered by faulty iPhone hardware. Either of these can be true. And this content will tell you why. Highlighted in this post are the possible reasons as to why the iPhone 6s microphone fails to deliver good quality audio output as expected. It also entails generic solutions and suggested workarounds for you to try, should you need help in troubleshooting pertinent issues on the same device. Contrary to what most people thought of microphone issues on the iPhone 6s are caused by hardware damage, there are a number of other cases which are found to be software related. As a matter of fact, several recent claims of microphone problems such as static or noisy background during phone calls, no sound or dysfunctional microphone had instigated after installing the latest iOS update on their respective iPhone devices. Other possible causes of microphone problems that are software-related would include but not limited to corrupted apps and files, incorrect audio settings, and faulty updates. There are also other cases where the microphone’s audio output is barred by third-party accessories. In worst cases, a faulty iPhone component is to blame. Here’s why and how each of these factors can possibly cause the iPhone 6s microphone to become dysfunctional. While software updates are primarily aimed at enhancing and optimizing devices, there are some updates that can contain bugs themselves. Buggy updates can affect any existing applications on the iPhone including those that are associated with the microphone. Instead of bringing positive results, post update issues manifest. It is inevitable for software updates to cause troubles to any devices upon implementation. One of the reasons as to why it happens is that fact that the devices used during prior evaluations and tests are totally different from what each and every iPhone users have. Settings already vary as users can configure their iPhone settings and options as they would prefer. Conflicts between the desired iPhone settings (iOS structure) and the actual settings configuration implemented by end-users is a potential factor that would matter. Sometimes the problem is not on the iPhone microphone but actually on certain apps or files that get corrupted. When a file or app gets corrupted, it becomes inoperable or dysfunctional. Typically, corrupted apps or files are remedied by an app or device restart. However, there are also some that could not be helped and users wouldn’t have other options but to remove or uninstall it from their iPhone. This is usually the case when you are trying to play or listen to an audio or video file on the iPhone but no sound or poor quality sound is produced. Most people think that the iPhone’s microphone is at fault but actually the problem is isolated on the app or file that gets corrupted. Generally, everything should work perfectly fine using the iPhone’s default settings. However, most users are fond of changing the defaults to what they would prefer. This should not be a problem for as long as everything is properly configured. But this is not always the case as many users would end up selecting the wrong options or settings configuration. That being said, the problem must be within the settings especially if the symptoms began to manifest after making changes on the iPhone or app settings. There are many previous instances where the iPhone microphone failed to produce quality audio, static, or no sound because some iPhone accessories or casing barred the microphone. Given the fact that these are made by third-party entities, there is a higher chance that they won’t fit with the iPhone’s actual physical scheme. Consider this the worst possible cause. Physical or liquid damage on the iPhone can also cause the microphone to become dysfunctional. This is usually the case if you happened to drop or get your iPhone soak in water or other sorts of liquid. Symptoms of hardware damage may appear soon or later from the actual incident of dropping or exposure to liquid. Unfortunately, microphone issues triggered by hardware damage on the iPhone would already require a professional’s aid in order to get fixed. This denotes a need for you to take a trip to the Apple Genius bar or authorized service center for hardware assessment and/or repair. The good thing about software-related problems is that they can likely get resolved by end-users themselves without having to pay for tech service. But that is considering that the iPhone has no signs of hardware damage and that there were no prior instances of hard falls or liquid exposure. Even a single instance of dropping or exposure to liquid can damage certain components on the iPhone. Symptoms may show sooner or later. If you suspect that hardware damage is inflicting your iPhone microphone any of the aforesaid symptoms, then you should consider taking your device to an authorized technician for further hardware assessment and possibly repair. If you are certain that the software is at fault, then you can try to troubleshoot the problem on your end instead. Remove any accessory that is plugged into the iPhone’s headset jack. Check the microphone and headphone jack for dirt, dust and debris. If necessary, clean up these parts. Dust and dirt can cover the microphone thus affect the sound quality received by the microphone on your iPhone. You can use a dust blower, toothpick or needle to clean these parts. 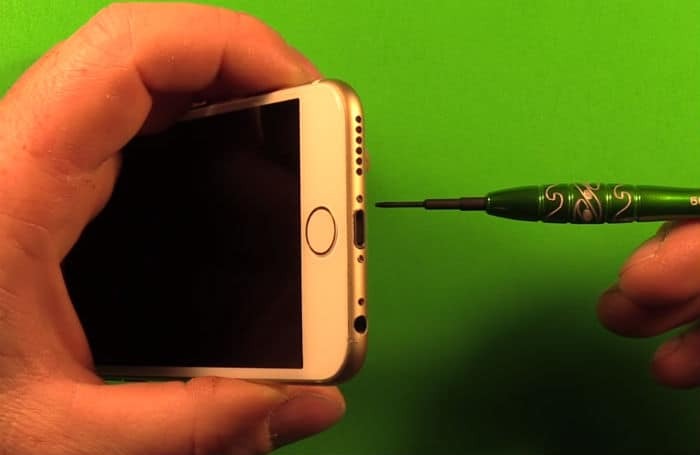 Try to remove any headphone accessory from your iPhone and make sure that there is nothing inside the headphone jack that might have blocked the sound from coming out. If necessary, you can try cleaning the headphone jack, the microphone as well as the iPhone receiver from any debris or dust. Over the phone conversations can also be affected by network issues. Among the symptoms that are network-related would include static background, low or distant sound, and intermittent audio or audio keeps cutting out when having a phone call. Many users who thought of these symptoms as indications of a faulty microphone on the iPhone 6s have later found out that unstable cellular network connection was the root cause. To rule out the possibility of the microphone/audio problem being inflicted by network issues, testing the iPhone’s microphones is recommended. Your iPhone’s primary microphone is located at the bottom. You can use the Voice Memos app, Siri, Camera app, and FaceTime to test this microphone. Tap the Record icon to start recording your voice. Speak into the primary microphone. As much as possible speak clearly with acceptable loudness. Once you’re done recording, tap the Stop/End icon. To listen to your voice recording, tap the Play icon. If you can hear your voice recording clearly then it denotes that the primary microphone is working properly. Alternatively, you can use Siri to test the sound quality produced by the iPhone microphone. To do so, open Siri app and then say anything you want Siri to do. If Siri couldn’t get your voice inputs, try to check the microphone located near the iSight and make sure nothing is blocking it. Do the same if other audio recordings sound faint when attempting to play it with your iPhone. Also check and ensure that nothing is covering the iPhone receiver if your voice sounds faint when using the speakerphone during phone calls. You can also test the microphone using the iPhone Camera or FaceTime application. To do so, open the Camera app, record a video to playback, then check whether or not you can hear your voice clearly during the playback. You can do the same with FaceTime audio. If everything seems to be fine with the audio outputs during prior testing, then it denotes that the problem is not with the hardware or iPhone’s microphone. In this case, the problem you’re facing is most likely software-related. Read on to learn what to do next. Press and hold the Sleep/Wake button for a few seconds until the red slider shows up. After the elapsed time, press and hold the Sleep/Wake button again until the Apple logo appears. Your iPhone will then reboot. Incorrect or improper audio settings configuration can also lead the same problems with the iPhone microphone. To make sure that this is not the culprit, ensure everything is properly configured. If the audio problems occur only when using a certain app, try to check the app’s permission settings to access the microphone. You can access and configure this option by heading over to Settings-> Privacy-> Microphone. Once you get to this menu, configure the options on apps permission accordingly. Another settings you can try to configure on your iPhone is Noise Cancellation. Noise cancellation is a useful feature used to reduce surrounding noises thus ensuring clear and noise-free background during phone calls. But for some reasons, enabling this feature had also caused undesirable effects to other people when it comes to the overall audio quality of the iPhone. That being said, you can try to toggle the Noise Cancelation feature on or off to see what happens. If the microphone problems occur with Noise Cancellation enabled, then try to disable the feature temporarily and see if doing so makes any difference. Otherwise, try to enable the feature on your iPhone. To access this option, head over to Settings-> General-> Accessibility-> Phone Noise Cancellation-> tap the switch to turn the feature on or off. If you think something in your iPhone settings is messed up and causing undesirable audio or microphone outputs, then you can revert the settings back to its prior configuration before the onset of the symptoms. However, if you find it hard to determine which settings has changed or what options to reconfigure, then your best option would be a settings reset. Please note though that when you reset all settings on your iPhone, customized settings will be erased and restored to defaults. On the positive side, any incorrect or misconfigured settings including those that are associated with the iPhone’s microphone or audio functions will also be corrected. To reset all settings, go to Settings-> General-> Reset-> Reset All Settings. If necessary, enter the correct passcode to proceed. Tap Reset All Settings again to confirm action. If necessary, reboot your iPhone 6s after the entire settings reset process is complete. If you haven’t done it already, then you should consider updating your iPhone system to the latest iOS version available. Aside from new features and enhancements, software updates also contain fixes to certain bugs that might have caused trouble to the iPhone’s audio system, thus resulting to faulty microphone. To check for available iOS update, go to Settings-> General-> Software Update. Usually you’ll see a notification for available update. If an update is available, tap Download and Install to proceed. Follow the onscreen instructions to complete the iOS update download and installation on your iPhone. A factory reset will wipe or erase your iPhone’s entire content and restores it to factory defaults. That being said, you should only consider this as your last resort. This is an effective solution especially for device issues that are associated with major software glitches that could not be dealt with by a soft reset. Given the fact that you’ll lose all your contents and personal information in the process, creating a backup is highly recommended. Tap Erase All Contents and Settings. If prompted, enter the correct passcode to continue, then tap Erase iPhone to confirm action. Wait until iTunes recognizes or detects your iPhone. When your iPhone is recognized, locate the option or button to Restore and set up your device as new. Follow the onscreen instructions to complete the restore process. Once finished restoring, you can configure your iPhone 6s as new. In case none of these methods is able to fix the microphone problem on your iPhone and that you are still having trouble with the output sound quality, then you should now consider escalating the problem to Apple Support. Doing so will give you a chance to request further assistance and other recommendations. However, if calling is not your option then you can take your iPhone to an authorized service center instead. You can have it checked for possible hardware damage and if necessary get it fixed. A microphone replacement might as well be needed.